In our efforts to keep diners in the know, we've compiled our annual master list of all the restaurants in Dallas and beyond, that are coming-soon for fall and beyond. Amorino Gelato, the Paris-born chain known for its picture-perfect cones that look like roses, is opening its second DFW shop at Legacy West. Late 2018. Banh Mi Station is a fast-casual restaurant opening at Sylvan Thirty that will specialize in Vietnamese street food including the popular banh mi sandwich. Opening in November. Beard Papa's is a Japanese chain that does cream puffs, with more than 500 locations around the world. Its cream puffs come in flavors like matcha and honey butter. It'll open two DFW locations, in Frisco and Plano, at 2301 N. Central Expy. Beverley's is a new neighborhood bistro on Fitzhugh Avenue at Travis from Greg Katz, a longtime Dallas F&B professional who was most recently with Headington Cos. The menu is still TBD but it'll be open in late fall for lunch, dinner, and weekend brunch. B. Frank & Relish is a new concept coming to The Boardwalk at Granite Park in Plano with steaks and an Argentinian wood-fired grill as the focal point. Opening mid-October. Billet is a new bar concept from Brooke Humphries, opening on Victory Avenue in Victory Park, with the date still TBD. Biscuit Bar, a fast-casual concept with biscuit sandwiches that opened its first location in Plano, has a second location opening by Southern Methodist University, at 6501 Hillcrest Ave. in 2019. Burgundy Swine is a wine bar/restaurant from a sharp team of oenophiles opening at Victory Park, with a target date of late November. Char'd: Southeast Asian Kitchen is a local concept specializing in dishes from southeast Asia such as poke, bibimbap, curry, and steamed buns. The inaugural location opened in Mansfield, and now a second will open at CityLine in Richardson in late 2018. Crumb and Kettle is a bakery opening in the Tyler Station complex in Oak Cliff, specializing in wedding cakes, cake by the slice, coffee, and tea. November 2018. Deli News is the authentic New York deli in North Dallas with pastrami sandwiches, matzo ball soup, and more, now opening a location in Frisco, sometime in October. Desert Racer is the new Baja-inspired cantina from chef Nick Badovinus, going into the former Haymaker space on Lower Greenville, with a live-fire/smoke method of cooking. Opening in fall 2018. Dibs on Victory is a two-story restaurant and bar from This & That Concepts (High Fives, Tiny Victories, Alice Dallas, Ferris Wheeler's), overlooking Victory Plaza across from the W Dallas Victory Hotel, opening in mid- to late-October. Duck Donuts is a Pennsylvania-based chain that does made-to-order doughnuts, where customers choose coating, topping, and drizzle. It'll open its first DFW shop in Addison, at 3765 Belt Line Road near Marsh Lane, in fall 2018. Eggsquisite Cafe is a local breakfast chain with locations in McKinney and Allen, opening a third in Frisco at 6801 Warren Pkwy. Fall 2018. El Bolero is the authentic Mexican restaurant in the Design District from Apheleia Group, owner of Oak Dallas, Pakpao Thai, and other concepts. It'll open a splendiferous second location on Fitzhugh in October. Empire Baking Company, the Dallas-based artisan bakery, will open a second much-anticipated location in early 2019 at The Hill, the development at the northeast corner of Walnut Hill Lane and US 75. Eno's Pizza Tavern, the thin-crust pizzeria with craft beer born in Bishop Arts, will open a third location at The Sound at Cypress Waters in Coppell, in early 2019. Flower Child is the hippie-ish healthy concept from Fox Restaurant Concepts, with a welcome-all menu that includes organic, gluten-free, and vegan choices. It currently has a location at Dallas' Inwood Village and will open a second location in Addison in fall 2018. Flying Biscuit Cafe is the homey Atlanta chain with biscuits, Southern home cooking, and a fun, casual atmosphere. The first Dallas-area location opened in Richardson in 2017, and now a location will open in downtown Dallas in fall 2018. Hatchways Cafe is a coffee shop that's part of the coworking concept in Victory Park from Tristan Simon's Rebees group. It'll be open to the public as well as members of the coworking space. Opening is spring 2019. Hawthorn is a steak, seafood, and raw bar concept from restaurateur Richard Ellman (Oak Dallas, Pakpao, El Bolero), opening in the AT&T Whitacre Tower in downtown Dallas — the first of several restaurants planned for the AT&T Discovery District, in 2019. Hero is a massive bar and restaurant concept jointly operated by Elias Pope (HG Sply Co.) and Brooke Humphries (Barcadia, Beauty Bar, Mama Tried, Mudsmith), opening at Victory Park, with the date still TBD. Homewood may sound like a hotel chain but it's the new concept from chef Matt McCallister, formerly of FT33, opening in Oak Lawn in a former Beck's Prime space. Details are slim but renderings show an open-fire hearth and direct views into the kitchen so that diners may gaze upon the chef in action. Hudson House is the spinoff of East Hampton Sandwich Co. which debuted in the Park Cities in 2017. The second location is in the Addison area at 4933 Belt Line Rd., in a former Taco Diner and is opening very very soon, maybe already. In N Out Burger is opening a location at 2525 Mockingbird Ln. in the new growing development near Maple Avenue. If a lease term can predict the future, it's going to be there a long time: Its lease expires in 2038. Jarams Donuts is the hugely popular North Dallas doughnut shop which is opening a second location in Lakewood, across from Whole Foods Market, in late 2018. Jinya Ramen Bar is from Tokyo restaurateur Tomonori Takahashi, who debuted Jinya in California, and has locations in Austin and Houston. He'll open one at Dallas' Victory Park in late fall 2018. Ka-Tip is a restaurant specializing in Thai street food from husband-and-wife George and YuYee Kaiho; George heads the bar program at Jettison at Sylvan Thirty. It'll open at the Dallas Farmers Market in fall 2018. Khao Noodle Shop is a restaurant specializing in Laotian food set to open in East Dallas next to Mai's and kitty-corner from Jimmy's Food Store. Serving boat noodles and Laotian bites, Khao is from chef Donny Sirisavath, who previously hosted pop-ups. King & Cardinal is a unique new burger joint opening in Frisco with not only burgers, but sandwiches, milkshakes, and bubble tea. Opening in October. Knife at The Shops at Willow Bend is a second location of the steakhouse at the Highland Dallas hotel from John Tesar, that's part of an effort to recast the upscale Plano mall. It will significantly expand the already established aged-meat program with steaks that are aged for 45, 60, 90, 120, 150, and 240 days. It will be accompanied by a Knife Burger and a Knife Butcher Shop, and is opening in early fall. La Viuda Negra is a new bar and restaurant opening on Fitzhugh Avenue dedicated to mezcal and pulque, another agave spirit, with a menu of Mexican street food. It's co-owned by Luis Villalva, chef at the nearby El Come Taco, and is set to open in October. 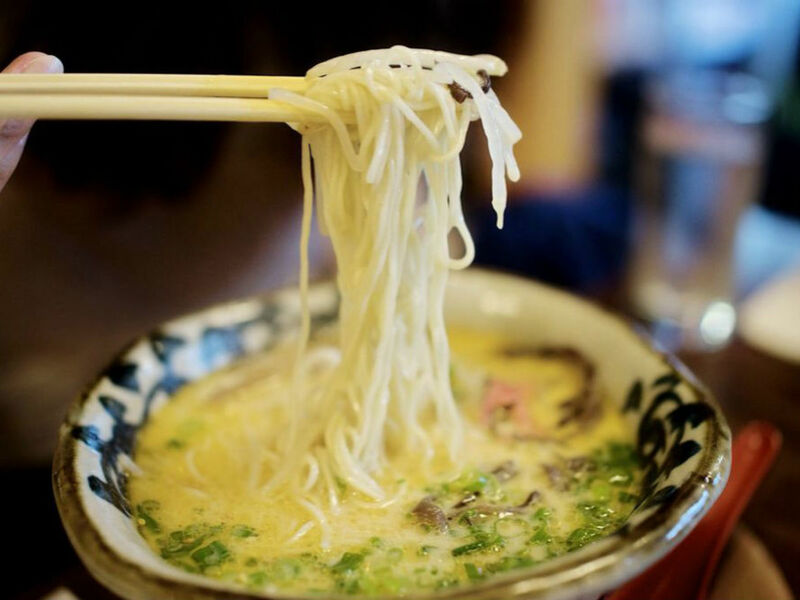 Marufuku is the top-notch ramen restaurant from San Francisco, where it has earned raves and long lines for its authentic tonkotsu ramen. This is the first location in Texas, the first outside of California, and the third for the chef-driven concept. It's opening in Frisco, at 9292 Warren Pkwy., in the same vibrant center as 85C Bakery and Kura Revolving Sushi Bar, in late October. Mike's Gemini Twin is a neighborhood bar on the Southside from Sam Wynne, co-owner of Braindead Brewing, and Pasha Heidari, owner of Bowen House, set to open in winter 2018. Minami is a Japanese restaurant opening in the retail portion of the Union Dallas project at Cedar Springs Road and Akard Street. This is a spin-off of Kotta Sushi Lounge, which opened in Frisco in 2007. Opening in October. Namaste is a new restaurant and bar opening in Addison from the founders of Social House that pairs American classics such as bowls, burgers, salads, and tacos with Indian flavors. Early fall. North Italia is the Italian-themed restaurant from Fox Restaurant Concepts, which already has a location in Plano and is now opening one at The Union Dallas, the mixed-use development at Field Street and Cedar Springs Road, in early 2019. Pokeworks is a New York-based poke bowl chain opening its first DFW location at the Hill development in North Dallas, in fall 2018. Redfield's Tavern is a bar and restaurant opening in Dallas' up-and-coming Medical District from Joe Tillotson, of Barley House and Katy Trail Ice House fame. Early 2019. SalaryMan is the challengingly-named ramen and yakituri restaurant in Bishop Arts from Justin Holt, chef at Lucia Dallas, opening sometime in the fall. Saltgrass Steak House is the hard-to-find steakhouse chain (only 16 locations in DFW) which is opening a new location in The Colony at 5909 Stone Creek Dr. Sauce Pizza is the former Fox Restaurant Concepts entity with pizza and great salads, entering the Texas market. It has one location open already in Prosper, and two more in the works in Irving at 7300 N. MacArthur Blvd., and in Dallas at 8185 Walnut Hill Ln., both set to open in the fall. Stampede 66, the Texana restaurant from Stephan Pyles that recently closed in Uptown Dallas, will resurface at a hotel in Allen, tentatively in early 2019. Sushi de Handroll is a quick-serve, fast-casual tempura and sushi hand-roll restaurant with fresh and healthy Japanese food opening at The Hill in late fall. Taco Lingo is the new taqueria concept from restaurateur Rich Hicks, founder of Pie Tap and Tin Star, opening at The Union Dallas, the mixed-use development at Field Street and Cedar Springs Road, in late fall. Tulum is a Mexican-ish restaurant from Mike Karns, head of Firebird (El Fenix, Meso Maya, La Ventana), opening in late October at Turtle Creek Village in the former Madrina space with a menu by Firebird corporate chef Nico Sanchez. Vitality Bowls does healthy bowls and is opening at Preston Hollow Village in Dallas, Frisco, and Las Colinas, along with other locations around Texas, although one in Colleyville recently closed. Wonders Ice Cream Company, a Minnesota company that does Thai-style rolled ice cream, will open its first location in Dallas inside a strip mall at 5150 Lemmon Ave. It'll open in late 2018. Other restaurants on the books for 2018 include The Henry, a Fox Restaurant Concepts restaurant, opening at The Union in downtown Dallas; Hillside Tavern, a sibling of Rapscallion and Boulevardier, opening at Hillside Village; Mexican Bar Co., a new restaurant and bar opening at the Shops at Willow Bend; National Anthem, a Nick Badovinus restaurant going into the vintage triangular Magnolia Oil building in downtown Dallas, with an accompanying coffee shop called PMA All Day; Punch Bowl Social, the Denver bowling alley-restaurant chain opening soon in Deep Ellum; San Martín Bakery from Guatemala opening in Uptown; and Terra Mediterranean at The Shops at Willow Bend.